CUBO is delighted to open the awards entry period for 2019. With another busy year across campus and commercial services, the buzz has already started about what projects will stand out in 2019. The CUBO Awards are open to all HE institutions in the UK and Ireland – membership of CUBO is not a prerequisite. Businesses working with HE institutions are also invited to enter the Business Partner of the Year Award. If you are new to the CUBO Awards and would like to take a peek at last year’s entries, the shortlisted submissions for 2018 are now available as case studies on the CUBO website. In a CUBO first, the 2019 awards ceremony will take place at a venue by the beach, part of the beautiful Swansea University Bay Campus. The awards and gala dinner are part of the three-day annual CUBO Summer Conference from 3–5 July 2019. 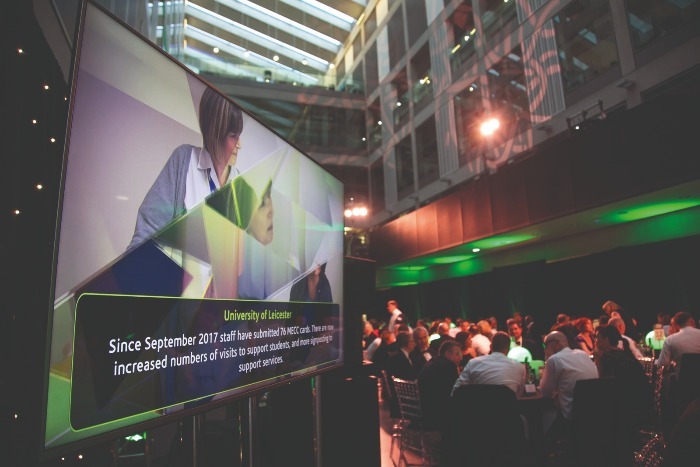 The awards have helped to raise the profile of both winners and entrants among key stakeholders, including vice-chancellors and university governing bodies. Shortlisted entries gain publicity across the HE sector and a feel-good factor for your team. Make sure you don’t miss out – start your entry today! Please read the full CUBO Awards entry criteria for each category and ‘How to enter’ at on the CUBO website. The closing date for entries is 1 March 2019. Recognising activities that support students living away from home at UK universities, entries should demonstrate initiatives that help to provide the best residential experience for students. A campaign that shows delivery against objectives. Entries are welcome from marketing and branding, to digital marketing, market research, CRM, communications and information campaigns. This category covers all areas of sport, from increasing participation to performance sport and promoting health and wellbeing through sport. A large or small university that shows they have significantly improved their commercial performance within campus/commercial services while enhancing the student experience. A student housing complex that shows the innovations and high standards to enable students to achieve their best in a home-from-home environment. A ‘foodie’ initiative that stands out from the rest. This may relate to the type of food, service, delivery, outlet or facility that offers something entirely new for customers. An individual or team who has performed over and above expectation in their work to enhance the student experience and/or develop a commercial business opportunity at their institution. Innovation in Student Experience This category welcomes entries from all areas of campus/commercial services. The judges are looking for an innovative product, service or campaign that has significantly enhanced the student experience. A business partner who shows they have integrated into the universities they work with, with marked outputs in the delivery of high-quality services to enhance the student experience. Selected by the Chair of CUBO. For those working in student housing with less than five years’ experience. CUBO is hosting the CUBO RA Awards again in 2019 to recognise the efforts of residence assistants working within student accommodation. Nine awards will be presented at the CUBO & ACUHO-I Residence Life Masterclass event 7–8 May 2019. The full details are available on the CUBO website.